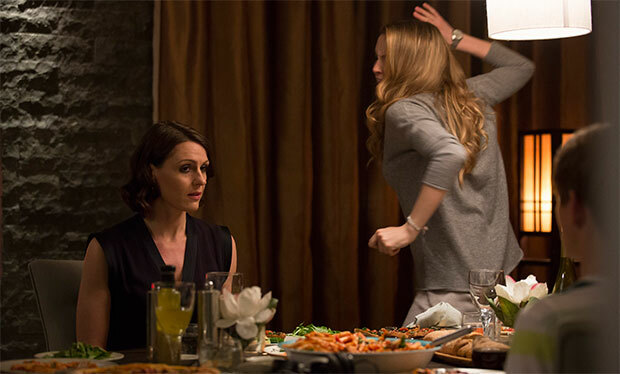 The jaw-dropping finale to BBC One’s gripping series Doctor Foster was watched by 7.8 million people last night. That’s 36.4% of television viewers that tuned in to see our new favourite TV doctor, Gemma Foster, wreak havoc upon her cheating husband, his other woman and anyone else that got in her way. The episode kicked off in the Parks’ family home with the characters preparing for what would be the world’s most awkward dinner party – they just didn’t know it yet. Tensions ran high between Gemma and Kate, the sparring women, but it was clear who was in control. Gemma was resolute throughout; this was a woman who knew what she was doing. As the secrets spilled out over the dinner table in a darkly comic way, Kate lost it – swearing at Gemma, who deftly retorted with the line, “I’m a wolf tonight”, dripping with malicious intent. With the dirty truth out in the open, viewers were desperate to see Simon do the right thing, apologise and, most importantly, do as he’s told. Watching him get into Kate’s car and drive away from Gemma broke what was left of our hearts. It was at this point the stony, vacant stare descended on Doctor Foster’s face. There’s no doubt in the last few weeks Suranne Jones has proved herself as one of the UK’s strongest actors; in this episode, her intense performance, which balanced on a fine line between determination and insanity, was second-to-none. It’s no surprise Twitter blew up with calls for her to win every award going. Gemma’s path of destruction continued to the neighbours’ house where her attempts to shock she was met with a brick wall. Just because her marriage was crumbling in front of her didn’t mean she could do the same to theirs. Here the episode did something very clever, it made us question if we still liked our heroine. After her straying into Neil’s bed in a previous episode, our loyalty had wavered. Now though, she was coming apart at the seams and it was difficult to know if we were on her side anymore. Our faith in her was tested when her aggressive side reared its ugly head. The image of her unfaltering anger and determination demonstrated in her increasingly bloody hands, her nails digging in and breaking the skin. The most nail-biting moment came after Gemma had whisked son, Tom, away from his school – most significantly, out of the clutches of his lying father. This second half of the episode became a power struggle between the parents, each using dirty tactics to try and keep their son on their side. Suranne Jones had us on the edge of our seats after her son told her he didn’t like her, “not at the moment”, he says. Her whole world falls apart. After losing her husband to another woman, losing her job to evil made-up comments, she now finds she has lost the one thing most dear to her and the one thing she thought she had left. She reaches into her medical bag, pulls out a pair of scissors, and looks up to her son. A bird’s eye view shot takes us away from the action and leaves us in the lurch. In her confrontation with Simon she asks, “Do you really believe I could do that?” and he replies, “I don’t know” and last night 7.8 million people wondered the same thing. It really is a testament to Jones’ performance that we actually believe she may have killed her own son. Without spoiling the end, it could be said that Doctor Foster didn’t give a satisfying resolution; it certainly didn’t leave anyone with a fuzzy feeling. In fact, there are even talks of a second series. However, perhaps it works best this way – after all, are there really any winners in a situation as tangled and emotional as this? Either way, this finale concluded an outstanding BBC drama with an even more mesmerising and excruciating finale. Flawless performances from Bertie Carvel and Jodie Comer as Simon and Kate respectively led a strong cast. Special mention should go to Tom Taylor who effortlessly played the couple’s confused and distraught son. No doubt though that the standout performance comes from Suranne Jones. Her bold and emotionally complex portrayal of a smart, outspoken and essentially unlikeable woman was unparalleled.